We often get asked why we don’t have a tradie reviews system for allowing the public to post reviews about tradespeople on Licensed NZ. In general our experience has been that tradie reviews are not a very reliable way of telling whether somebody is good to hire for a job or not. Reviews can easily be faked or biased to the point that they are unreliable. A big flaw in relying on reviews is that they are just an opinion, usually by somebody who is not in any way qualified or experienced in that particular trade, or worse, written by the tradesmen’s family, friends, or themselves just to make their business look better. Read this recent article about an unlicensed electrician. This faking of reviews is a lot more common than people realize and is a big problem for review sites. We have talked to many tradespeople that openly admit to doing so in order to get more work. We believe that in order to trust reviews the job itself would need to be reviewed by a qualified reviewer in that trade. The cost involved in professionally inspecting jobs that tradies have been reviewed about would be prohibitive which is why it is not done. 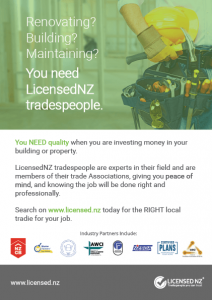 One of the reasons we setup Licensed NZ was to give you confidence in the tradespeople that you hire and to know that the tradespeople they hire have been screened and accepted by professional trade associations (i.e. those qualified and experienced enough to judge somebodies work). Remember if we don’t have the right tradie available on our site for you, just fill out the form that is displayed and we will use our contacts to find a professional local to you within 24 hours. Now that spring is here, its time to start on all those renovation and other projects, we encourage you to search our members and use them wherever possible. Remember when you hire a tradie that is a member of an Association, you also get the advantage of the backing of the Association in the rare case of a dispute. The Team at Licensed NZ.